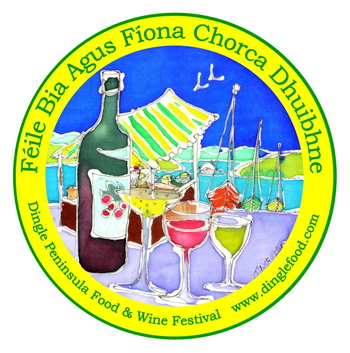 This year, for the Dingle Food and Wine Festival, we’re not going gourmet with some of the unusual flavour arrays we’ve done in the past. Instead, we’re going to do something that’s very delicious and simple – ice cream cookies! We’ll serve them with a glass of Kerry cow milk that we’ll get straight off our farmer and pasteurise. We’ll also do a mini Kerry cow milkshake. I hope those of you who make it to the festival enjoy it, and I do hope you’ll make it. It’s really one of the best times to be in Dingle, and there’s certainly no shortage of things to do and eat! 1. Make my chocolate chip cookie recipe (here). 2. Wait until the cookies are cool. 3. 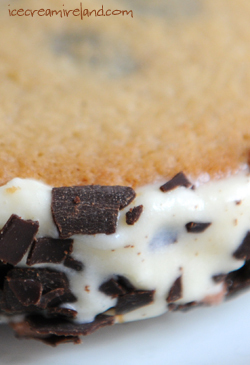 Spread a half scoop of vanilla ice cream (we’ll use Kerry cow ice cream, but vanilla is close!) on the flat side of one cookie. 4. 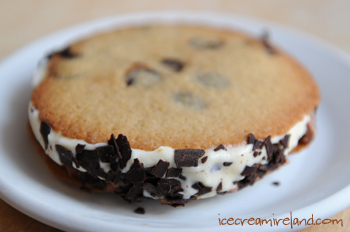 Spread a half scoop of chocolate ice cream (or dark chocolate ice cream) on the flat side of a second cookie. 5. Press the two cookies together. 6. Put them in the freezer to harden (if the ice cream is too soft, it will be much harder to eat it). Children’s Book for an Ice Cream Lover? Great dessert, the glass of fresh milk makes a part Irish cheesehead such as myself proud. I always want to do something like this for our family picnics, but it’s just too hot and I don’t feel like messing around with dry ice. This would work well for this time of year. please please please do these in your wicklow street store! That sounds yummy! It is more delicious if the cookies have chocolates inside it and it is chewy not crispy. I will try this tomorrow. Thanks for the indulging idea. One of the best deserts of all time. Amazing. Cant wait to try this new recipe. This is awesome! I never thought of this before. My kids will be surprised if I gave them ice cream cookies for our deserts. This is really a new one for us. Thanks for the wonderful recipe. looks delicious!the murphys on wicklow street is my favourite haunt for a coffee and ice cream treat. heavenly!